At Insider Monkey we track the activity of some of the best-performing hedge funds like Appaloosa Management, Baupost, and Third Point because we determined that some of the stocks that they are collectively bullish on can help us generate returns above the broader indices. Out of thousands of stocks that hedge funds invest in, small-caps can provide the best returns over the long term due to the fact that these companies are less efficiently priced and are usually under the radars of mass-media, analysts and dumb money. This is why we follow the smart money moves in the small-cap space. In this article, we are going to examine what hedge funds think about Aspen Insurance Holdings Limited (NYSE:AHL) – does the company represent a good buying opportunity? Aspen Insurance Holdings Limited (NYSE:AHL) was in 20 hedge funds’ portfolios at the end of September. AHL shareholders have witnessed a small decrease in activity from the world’s largest hedge funds lately, as there were 24 smart money investors long the stock at the end of the second quarter. The number of shareholders the company had at the end of the third quarter wasn’t enough for it to rank as one of the 30 most popular stocks among hedge funds in Q3 of 2018. In spite of the fact that Aspen Insurance Holdings Limited (NYSE:AHL) wasn’t one of the favorite stocks during the third quarter, it should still be examined further. At the end of this article, we’ll also check how popular was the company when compared to the other similarly valued companies. According to most shareholders, hedge funds are seen as unimportant, old financial tools of years past. While there are over 8000 funds trading at the moment, Our experts choose to focus on the masters of this group, around 700 funds. Most estimates calculate that this group of people control the majority of all hedge funds’ total capital, and by watching their highest performing equity investments, Insider Monkey has discovered many investment strategies that have historically outstripped the market. Insider Monkey’s flagship hedge fund strategy outstripped the S&P 500 index by 6 percentage points per annum since its inception in May 2014 through early November 2018. We were able to generate large returns even by identifying short candidates. Our portfolio of short stocks lost 26.1% since February 2017 even though the market was up nearly 19% during the same period. We just shared a list of 11 short targets in our latest quarterly update. Let’s analyze the latest hedge fund action regarding Aspen Insurance Holdings Limited (NYSE:AHL). At Q3’s end, a total of 20 of the hedge funds tracked by Insider Monkey were long this stock, a decrease of 17% from the second quarter of 2018. 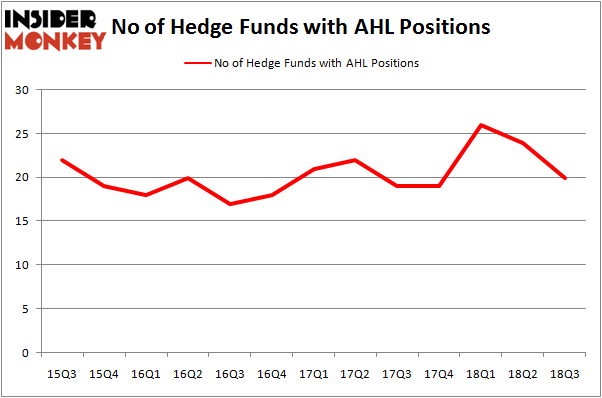 The graph below displays the number of hedge funds with bullish position in AHL over the last 13 quarters. With hedgies’ sentiment swirling, there exists an “upper tier” of key hedge fund managers who were increasing their holdings considerably (or already accumulated large positions). The largest stake in Aspen Insurance Holdings Limited (NYSE:AHL) was held by Alpine Associates, which reported holding $84.8 million worth of stock at the end of September. It was followed by Millennium Management with a $83 million position. Other investors bullish on the company included Pzena Investment Management, GLG Partners, and Citadel Investment Group. Because Aspen Insurance Holdings Limited (NYSE:AHL) has faced bearish sentiment from the entirety of the hedge funds we track, we can see that there were a few hedge funds who were dropping their positions entirely last quarter. 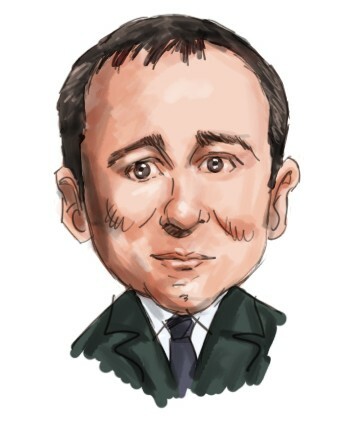 Intriguingly, Daniel Johnson’s Gillson Capital sold off the biggest stake of all the hedgies watched by Insider Monkey, comprising close to $22.1 million in stock. Ron Bobman’s fund, Capital Returns Management, also dropped its stock, about $12 million worth. These bearish behaviors are important to note, as aggregate hedge fund interest dropped by 4 funds last quarter. Let’s check out hedge fund activity in other stocks – not necessarily in the same industry as Aspen Insurance Holdings Limited (NYSE:AHL) but similarly valued. These stocks are Edgewell Personal Care Company (NYSE:EPC), Mimecast Limited (NASDAQ:MIME), Allscripts Healthcare Solutions Inc (NASDAQ:MDRX), and Artisan Partners Asset Management Inc (NYSE:APAM). All of these stocks’ market caps resemble AHL’s market cap. As you can see these stocks had an average of 19 hedge funds with bullish positions and the average amount invested in these stocks was $295 million. That figure was $447 million in AHL’s case. Mimecast Limited (NASDAQ:MIME) is the most popular stock in this table. On the other hand Artisan Partners Asset Management Inc (NYSE:APAM) is the least popular one with only 13 bullish hedge fund positions. Aspen Insurance Holdings Limited (NYSE:AHL) is not the most popular stock in this group but hedge fund interest is still above average. This is a slightly positive signal but we’d rather spend our time researching stocks that hedge funds are piling on. In this regard MIME might be a better candidate to consider a long position.